According to Wikipedia, "Morning sickness, also called nausea gravidarum, nausea, vomiting of pregnancy (emesis gravidarum or NVP), or pregnancy sickness is a condition that affects more than half of all pregnant women. Sometimes symptoms are present in the early hours of the morning and can reduce as the day progresses. However, in spite of its common name, it can occur at any time of the day. For most women it may stop around the 12th week of pregnancy." If you're suffering, we know this can be a really difficult time, especially as you're excited about your pregnancy, but are feeling too sick to enjoy it. So we have put together a number of products, from sprays, sweets to teas to help alleviate the sickness and get you back to your glowing best! 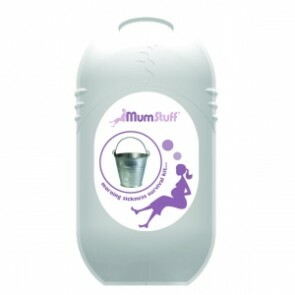 MumStuff's exclusive 'pop in your handbag' Morning Sickness Survival Kit is the perfect gift for that early stage of pregnancy when you're not feeling quite yourself. 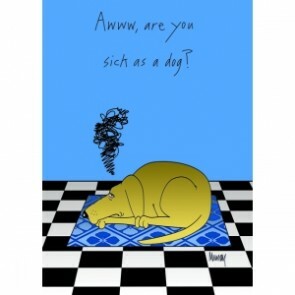 Awww, are you sick as a dog? We love this card, as it pulls no punches! Inside it reads 'Heal! Get Well soon' and has a lovely picture of a smiley dog with a butterfly on its nose. 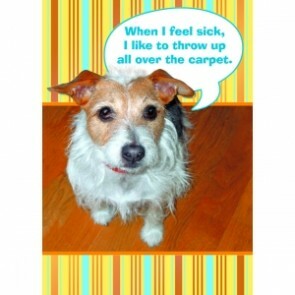 'When I feel sick, I like to throw up all over the carpet.' Ok, it's not very subtle but it is bound to get a giggle! 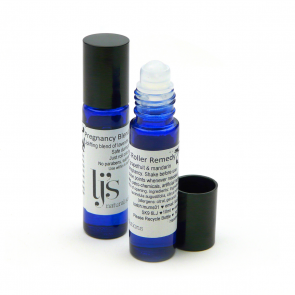 Natalia's Morning Sickness Ease is an organic handy pulse pointer to roll onto the insides of wrists and inhale when you are feeling nauseous or are flagging; ideal for discreet use at work!